This four peak weekend was scheduled for the California Mountaineering Club. Saturday morning, I began up the trail from South Lake for the first two peaks, Gilbert and Johnson. This was my 3X for both. I had three other climbers attending this trip. One was slow, so had to be turned back at Treasure Lakes. He was to meet us for camping later. I took the other two, cross-country, up the class 3 diagonal ledge to the main crest, then over and up to the sandy top of Gilbert. We enjoyed the view, to the south, of the Palisades, and Devils Crags. The weather was nice, so we continued over the class 3 traverse to the summit of Mt. Johnson. This climb was old hat for me then, and I would have liked to see that I could have still done it. The total gain, for these two peaks, is 4,500 feet, over some 8 miles. I shot more summit photos. We scree-skied down the southeast slope of Johnson. Then, the rain set in. I used my Patagonia rainwear which worked really well for a light afternoon thunderstorm. A layer of light polyester under water resistant, super light, nylon parka and pants kept me quite comfortable. When the sun comes out, it dries almost instantly, with help from a warm breeze from the desert. A rainbow made a photo bonus. Back to the South Lake parking at a very good time, no one wished to descend back into Bishop for a nice dinner. We had burgers at the old Parchers Camp Rainbow Lodge. Camping at Four Jeffrey campground, I tried to watch the Perseid meteor shower. That was near its peak. The next day, only Tet wished to complete the weekend's climbs. Hurd and Chocolate are not listed peaks. 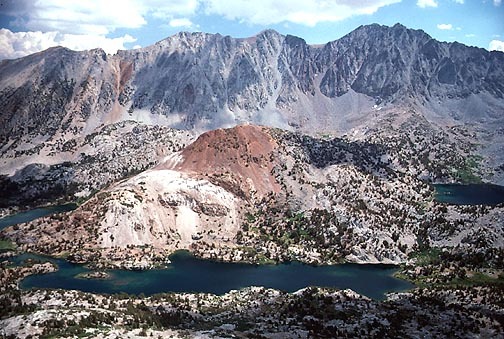 But Tet was also working on doing all the named peaks in the Bishop Creek watershed. We hiked back up toward Treasure Lakes, and headed cross-country up the leftmost gully on the west side of Hurd Peak. This was easy three, with some loose rocks. Traversing right to the summit, I was surprised that the top came up so quickly. We signed in my register book, placed a few years earlier. I took us down the class 2, steep, sand gully down the east side. Passing the lake, we then hiked up Chocolate Peak, which is an easy class 1 climb. 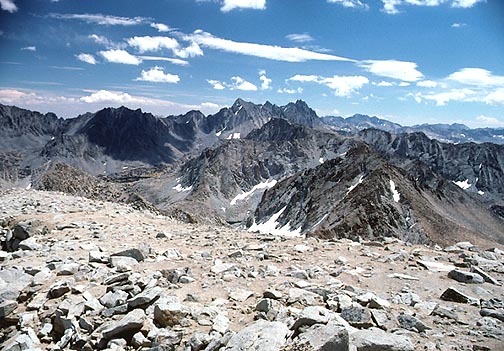 In the photo, below left, shot from Hurd Peak, Chocolate Peak is the lower, reddish brown bump. Inconsolable Peak is the higher one in the rear, to the right. We relaxed on the modest view. The rain held off, till after we were back to the cars, at 4 p.m. I don't know of more peaks climbed by any group, in this area, for a two day weekend. Many groups do the two main listed peaks, one each day, if even that. I was so pleased at discovering the class 3 traverse, I considered this one of my favorite leads.